On Friday 17 August 2018, 700 ECMS early childhood professionals came together for another successful Beyond Tomorrow Conference. For the second year in a row, Beyond Tomorrow was an internal ECMS staff event, which enabled us to tailor the conference program to the specific needs and interests of our staff and teams. This included more sessions presented by ECMS educational leaders and focused on the programs being run within our services. 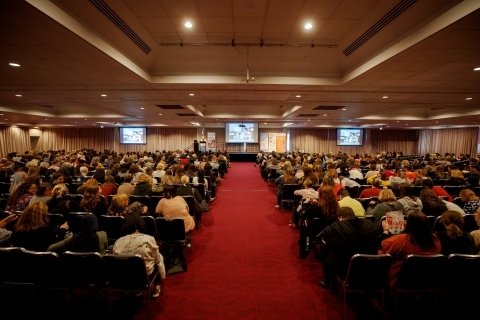 This year’s conference was held at a new venue, Moonee Valley Racecourse. This included a revamped staff recognition and awards program, wellbeing activities like Bike N Blend, upgraded exhibitor booth packages, more breakout sessions and more interstate speakers providing diverse perspectives and expertise on a range of early childhood topics. The 2018 conference theme was ‘Exceeding Expectations’, which emphasises the new guidance on determining an 'Exceeding' rating as part of the National Quality Standards. That is, ensuring quality practice is embedded in service operations, informed by critical reflection, and shaped by meaningful engagement with families and the community. We had the privilege of learning from Australia’s most in-demand female speaker, Rachael Robertson: global leadership expert, former Antarctic expedition leader, Chief Ranger and the second female in the world to lead a team of 120 strangers to Davis Station through the most extreme and hostile environment on Earth. Rachael inspired us all with her concepts of teamwork and leadership, such as ‘Respect Trumps Harmony’, ‘Leadership is not a title’ and ‘No Triangles’. Joining Rachael for breakout workshop sessions throughout the day were more than 10 of Australia’s top early childhood experts, including Catharine Hydon, Dr Red Ruby Scarlet, Glenda Grummet and Kate Power. The very popular ECMS Thank You Wall returned this year, allowing staff members to express their gratitude towards their valued colleagues. A Photo Booth with graphics themed around early childhood was reintroduced to encourage networking and interaction between colleagues. To conclude a successful day, attendees celebrated ECMS and connected with peers over drinks, canapes and relaxed jazz music. We are grateful for the ongoing support of our long-term Beyond Tomorrow sponsors: McArthur, Modern Teaching Aids, AIB Insurance and HESTA.